Salesforce Essentials is the cloud solution built to help you win more customers and keep them happy. CRM centralizes data so you can sell smarter and help customers faster. 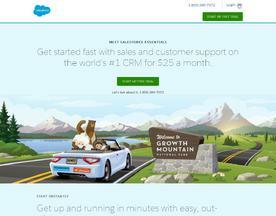 Get started with sales and customer support on the #1 CRM for $25 a month. 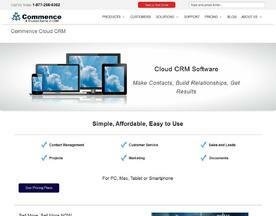 The # 1 competitor to industry giants Microsoft CRM and Salesforce.com. Robust feature set that’s easier to use and half the cost. Offers best practices and an array of value added customer services for sales and marketing. Used by several thousand small to mid-size businesses. A MUST HAVE ON YOUR SHORT LIST. 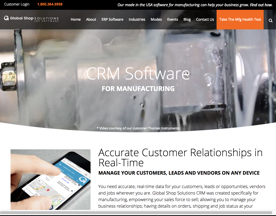 Manage your customers, leads and vendors from any device with Global Shop Solutions CRM software. Empower your salesforce to sell while integrating your data with your shop floor, inventory, scheduling, shipping and more.